The Christian life is the life of God accomplished in men by the Spirit of Christ. Men can live as Christ has lived, doing the things that he did and becoming sons of God in Him by the power of the Holy Spirit. Thus, once more, the Christian life is a Trinitarian life. By the Holy Spirit given by God through Christ, men can share the life, the love, the truth, the freedom, the goodness, the holiness, the wisdom, the knowledge of God Himself. It is this conviction and experience which has caused the development in the Orthodox Church of the affirmation of the fact that the essence of Christianity is "the acquisition of the Holy Spirit" and the "deification" of man by the grace of God, the so-called theosis. The saints of the Church are unanimous in their claim that Christian life is the participation in the life of the Blessed Trinity in the most genuine and realistic way. It is the life of men becoming divine. In the smallest aspects of everyday life Christians are called to live the life of God the Father, which is communicated to them by Christ, the Son of God, and made possible for them by the Holy Spirit who lives and acts within them. And the Spirit and the Bride (the Church) say Come! 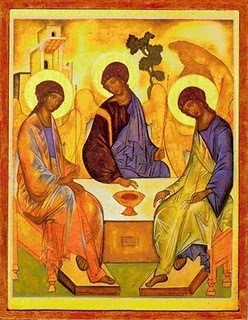 In the eternal life of the Kingdom of God, the Holy Trinity will fill all creation: the Father through the Son in the Holy Spirit. Every man enlightened by Christ in the Spirit will know the invisible Father. "And this is eternal life, that they may know thee the only true God, and Jesus Christ whom thou hast sent" (Jn 17:3). Such knowledge is possible only by the indwelling of the Spirit of God, "the fullness of Him who fills all in all" (Eph 1:23; 2:22). O Holy Mighty through whom we know the Father and through whom the Holy Spirit comes into the world!